1 April - 8 December. The last 15 kilometres of the approach road to this site are not for the faint hearted, but with due care the winding mountain roads will cause you very little difficulty, and if a remote rural setting is what you are looking for, this could be the site for you. The main area is attractive: on the right is a beautiful stone building housing reception, a bar and a restaurant, to the left an avenue of modern chalets for rent. The toilet block is also of traditional stone. There are 60 touring pitches, all with electricity (3/7A), most at the far end of the site, on level grass but with no shade and rather featureless, but the views are stunning, and in the evening with a glass of wine and some local cheese...heaven! A row of army-style tents on wooden platforms belongs to a Dutch tour operator and next to them are four smaller tents for hire from the campsite in July and August. The pleasant restaurant is open to the public and is popular with locals (restricted hours in low season). The Vall de Sau Collsacabra, in which the site is located, is very popular for cycling and walking and has breathtaking scenery. 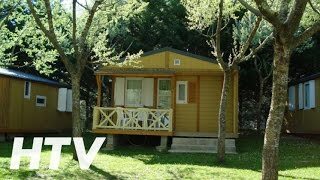 This is a quiet and relaxing site ideal for campers and motorhome owners, though you probably wouldn’t choose to tow a caravan over the winding and sometimes steep mountain road for just a short stay - so stay longer and enjoy the beauty of the scenery. The central toilet block provides open-style washbasins, some with hot water. Private shower cubicles (but no door to the changing area). Baby baths. WCs for disabled visitors (no showers). Washing machine. No shop (bar sells essentials). Bar with takeaway and separate restaurant (restricted opening in low season). Swimming pool (June-Aug). Games room. Play area. Communal barbecue area. Chalets and tents for hire. Site unsuitable for long vehicles (7.5 m. max). 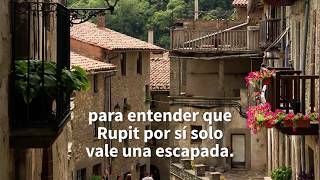 Rupit is 30 km. south of Olot. From Olot head south on C152, then C153 for 31.5 km. This road climbs steadily and is very winding in places. Site is 1 km. before the town of Rupit. The site entrance is on a sharp bend where extra care is required. From the direction of Vic, go past the turning for Rupit and site is a little further on the right.